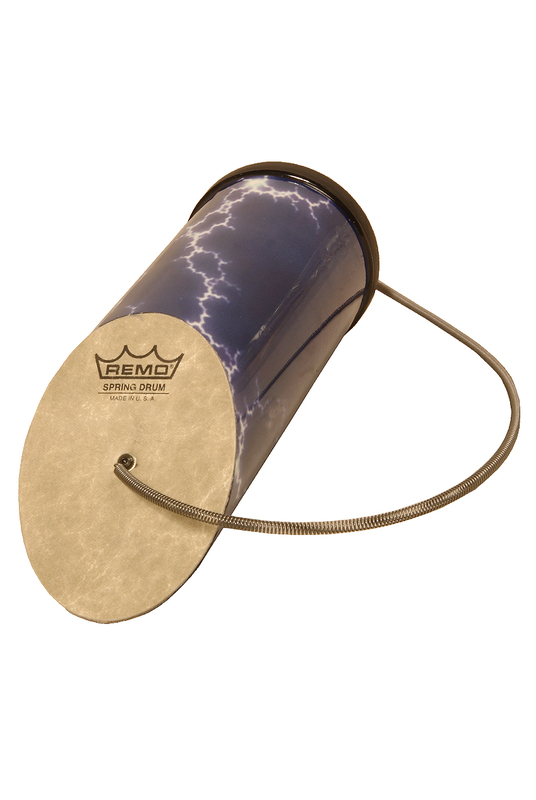 Remo 10 x 4 Inch Spring Drum Angled Stormy Print SP 0410 1A. This simple tube shaped instrument drum is angled at one end with a wire spring dangling from a synthetic Fiberskyn head. Even the most musically deprived will be able to make a variety of special effects sounds. Roll and shake it to create rumbling thunder. Strike it on the spring to get a thunder clap. You get great SiFi sounds from this neat little instrument. Drag a stick along the spring to change the sound yet again. Tap and rap the head to add dramatic beats. You can vary the pitch by putting your hand over the opening. A must have item; too much fun to only have one. This Spring Drum has a 4 inch Diameter and is 10 inches in length., and is decorated with the colorful Stormy Graphics.